Starring: Rishi Kapoor, Ayushmann Khurrana & Sonam Kapoor. 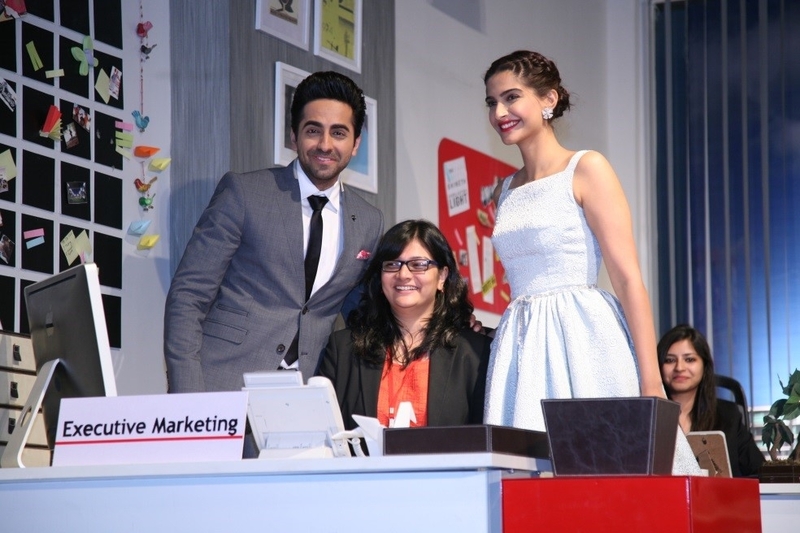 Ayushmann Khurrana and Sonam Kapoor choose the very lucky winner of the ‘Get A Job At YRF’ contest amidst much fanfare at a media event held at YRF Studios yesterday. ‘Get A Job At YRF’ received a thunderous response from enthusiastic applicants from across the country along with over 250 excited walk-ins who were present at the event! Armed with the required qualifications and brimming with passion for the marketing position, the winner mesmerised Ayushmann and Sonam and the audience present in the final selection round. Directed by Nupur Asthana and Produced by Aditya Chopra, BEWAKOOFIYAAN, is a contemporary slice of life story which turns set notions about relationships on their head. The film has been written by the versatile writer/director Habib Faisal. The film stars Rishi Kapoor, Ayushmann Khurrana and Sonam Kapoor in lead roles. BEWAKOOFIYAAN releases worldwide on 14th March 2014.